Apple's late founder Steve Jobs famously ended his keynote product announcements with "one more thing." Here are two more from the 25th running of Lightfair, just concluded in Las Vegas. This is a very slick app for an iOS tablet. It's an aid to calculating ROI on a building upgrade. It allows a lighting contractor or specifier to hand the potential client a full report in PDF form, quoting expected energy savings and time to ROI -- within minutes of visiting and surveying a property. The report contains all the information in neatly packaged form that various levels of decision-makers will need in order to sign off on such a project -- the facilities manager, the CFO, and the CEO. The specifier can take pictures of the facility using the tablet's camera, and these will be incorporated into the report. Once the numbers and types of fixtures are enumerated, the app recommends suitable replacement products and calculates out the costs. It's one visit and done for the early phase of a project proposal. An online "quick audit" demo gives a flavor of the app, producing a 1-page summary report with time to payback. The app is available free from TerraLux's site (visit this link on your iPad). It perhaps falls into a class of tools we discussed a few weeks back, along with Osram's Info Base package of resources for product designers. It offers major convenience and labor-saving, at the cost of favoring one company's products to meet project needs. TerraLux's Matthew Sallee told me that the app has been available for about a month but that Lightfair was its coming-out party. A number of lighting contractors have downloaded a copy, but it's early days in terms of learning how useful it will prove to be in the field. But on quick acquaintance, TerraLux's app looks well thought-out and beautifully presented. 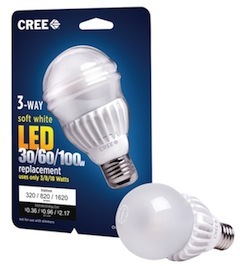 Cree's A21 bulb is characterized as equivalent to a 30/60/100 Watt incandescent. In fact the lumen values are 320/820/1620 lm. Input power is 3/8/18 Watts, so the efficacy is 107/103/90 lm/W for the three settings. According to Ed Rodriguez's analysis of the Feit/Utilitech 3-way LED bulb, in terms of popularity the traditional incandescent 30/70/100 Watt 3-way is down the list, after 50/100/150 and 100/200/300. One reason for its lesser popularity is the small perceptual difference between the light output at 70W and 100W, due to the logarithmic response of the human visual system. The analogy Ed used was that of a currency system featuring $1, $9, and $10 bills. This complaint applies to some extent to 3-ways in general. Cree makes a point that its 3-way's highest setting does not disappoint. Indeed 1620 lm is a reasonable level of light output to equate to a 100W incandescent, and it should be a noticeable bump up from the middle setting at 820 lm. I saw the 3-way only in its packaging at Lightfair, not in use. The bulb is available now through Home Depot online and should be rolling out to physical stores within days or a week or two at the most. It is priced at $24.97, which Cree claims is cheaper by far than competitive offerings. I found this Feit 3-way ("30/70/100W," 600/1100/1600 lm) at Amazon, for $45.00. It's a yellow remote-phosphor design and it looks weird. It's a safe bet that Cree is working on a 50/100/150 Watt equivalent.